Matt Forbeck and I started off on the wrong foot. He phoned me to object to a Dragon magazine article subtitle, which I didn’t realize mirrored a phrase associated with the Deadlands roleplaying game. After a few confusing moments and an email assuring him that it was an ignorant error, all was settled. Whew! 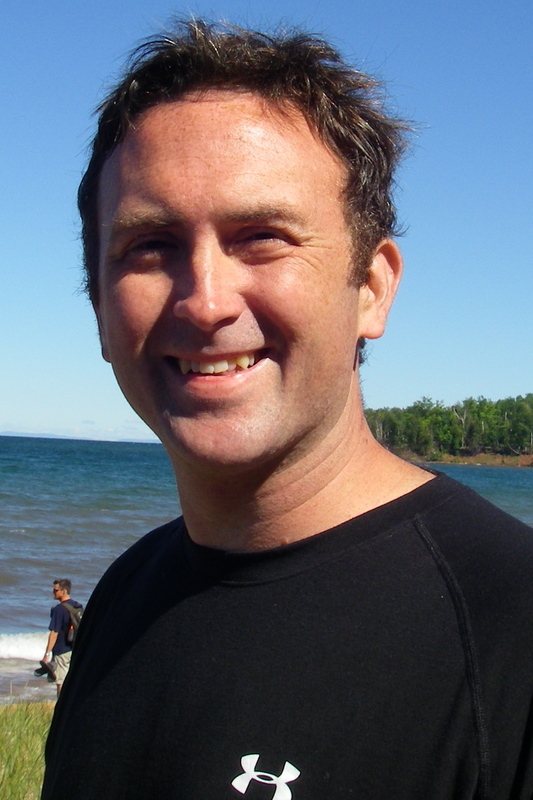 A couple of years later, Matt joined my old writers’ group based in Wisconsin, but I’d already migrated to Seattle. We didn’t meet until the San Diego Comic Con, where I found him to be every bit as pleasant as our mutual friends had assured me. Lately we see each other at the Diana Jones Awards at Gen Con and exchange updates on our recent projects through the Alliterates. Matt continues to shame the rest of us with his superhuman output, with Kickstarter projects, contract jobs, and novels published via Angry Robot Books and (soon) Tor. 1. With the dozens of projects you’ve been doing these past few years, sometimes I think you’re the most visible member of the Alliterates. For those who may know you only for games, or only for tie-in fiction, or only for game design, or only as someone who occasionally posts status updates from Shanghai, could you give us an overview of the many different sorts of writing you’ve done? Um, and probably some I’m forgetting. I also used to work as an editor and line developer for novels and game lines. I’ve been at this full-time for almost 25 years, and when I look down, it tends to blur like I’m riding a rocket. I tend to focus on what’s in front of me instead. 2. How did the whole thing start? I first became aware of you when you were working for Pinnacle, but something tells me your origin story begins when you were a teenager at Gen Con. I went to my first Gen Con when I was 14. My dad dropped me and my pals off at UW-Parkside for Gen Con 15, and then came back and picked us up every night. It was one of the great perks of growing up in southern Wisconsin. The next year, the Polyhedron (which was the magazine of the Roleplaying Gamers Association) published my first piece: a Top Secret gadget I’d entered for a contest. It only came is as a runner-up, but it made it into the magazine, and that hooked me good. When I was 16, I started my own general gaming fanzine called The Quill & Scroll, and I had my first booth at Gen Con 18, which was the first year the show was in Milwaukee. I had no idea what I was doing, and I had to fold up the magazine after just two issues. I put every dime I had at the time into it, but I still think it was the best money ever spent on my education. I started playtestings games for Pacesetter when I was 16 too. I drove up to Delavan after soccer practice to try out new games with Troy Denning, Steve Sullivan, Mark Acres, Gali Sanchez, and so on. When I was heading off to college at the University of Michigan, Troy put me in touch with Will Niebling, whom I’d also met at Gen Con, and Will hired me on as an associate for his game sales rep business. Will taught me the business side of the industry, and I got hooked even harder. When I got out of college, I went to work for Games Workshop on a student work visa, which is a story worthy of a full chapter or at least a few beers. Once I came back home, I went into freelance game design and editing full-time, and I’ve been at it ever since. 3. Your work ranges from techno-thriller (Amortals) to supernatural horror (Carpathia) to high fantasy (the Magic: The Gathering comic) and virtually all geek points between. Is there a “sweet spot” for your personal tastes in genre fiction? That is, if you were placed in an isolation tank with writing materials and no contracts, what would you write? I don’t tend to think of myself as a particular kind of writer, one that slots into a single genre—like epic fantasy or space opera—and stays there. When I write original novels, I go with what I like, and that spans a wide field. Most of my books have elements of mystery, adventure, and magic, but not all. My Dangerous Games books, for instance, don’t have a single supernatural thing in them, and my upcoming novel Loot Drop (which I’m writing this year, to be published by Tor) doesn’t either. I’ll read anything, as long as it’s well written, and the same goes for my writing. I just want it to be engaging entertainment. 4. On a personal note, as a man with approximately 100 children, how do you maintain such prolific output? What tricks must you employ, and what sacrifices have you had to make to get the job done? Those children serve as my inspiration. My wife and I have to keep them fed, housed, and clothed, and that’s no small task. I write a lot of things not despite them but because of them. To keep on task, I try to set myself daily goals for word counts, and I sometimes work long hours. I remind myself often, though, that my kids won’t be home with me forever and I need to spend as much time with them as I can before they head off to college and their wider lives. As for sacrifices, I don’t have a lot of free time left over after work and family, but I don’t mind that much. I love my family and my work, so letting other things slide doesn’t sting, especially by comparison. I let myself out of my cage and get to my writers’ group (our fellow Alliterates!) once a month or so and to the occasional convention. Those gaming cons serve as both family and work time too these days—since my kids all love games—so I suppose I’m just blurring it all together in a different way. That helps keep me fresh and excited for my next projects though. 5. Having briefly met your superheroic brood at Gen Con, I can’t help but think Monster Academy is in part inspired by or written for them. How much of that is true? All of it! I wanted to write something that all my kids could enjoy, regardless of their ages, and I even modeled a set of goblin quadruplets in the books after my own set of quads. Pat, Nick, Ken, and Helen map directly to Ay, Bee, Cee, and Dee, and I hear them cackling about it as they read the stories. There’s no direct correlation for my eldest, Marty, in the book, but I like to think of him as the hero, Ruddy. He has a similar spirit: strong, noble, and fun. Plus, I root hard for him too! 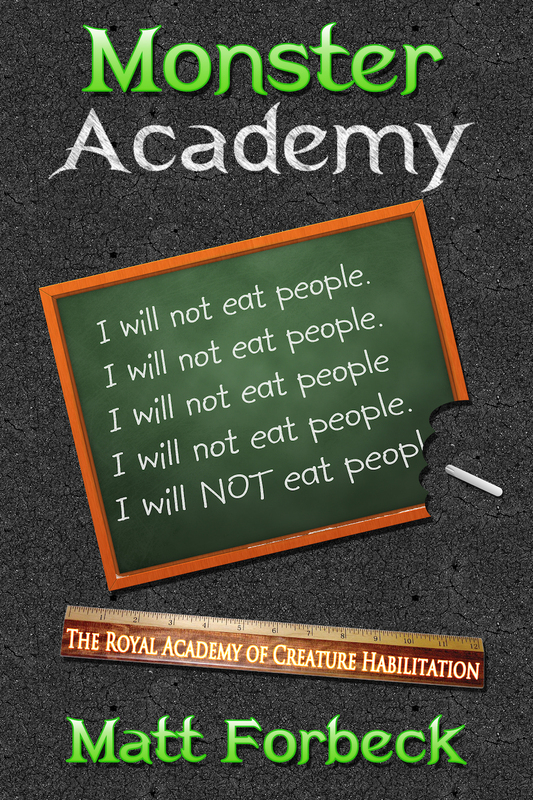 Check out Matt’s latest release, Monster Academy: I Will Not Eat People, and keep track of his blinding flurry of new projects at his website. This entry was posted in Writing and tagged Creative Colleagues, Tor by Dave Gross. Bookmark the permalink.